Always attention to detail, technical skills, passion in our work and great attention to customer needs are the strengths that have allowed us to excel in the field of sale of Airbrush Kit "PAASCHE". Consultando il catalogo di Aerografando you will immediately notice how vast it is and how diversified the model range is Starter Set, you will find the best Airbrush Kit "PAASCHE" offers at the best prices on all Airbrush Kit "PAASCHE" of the brands Aerografando. 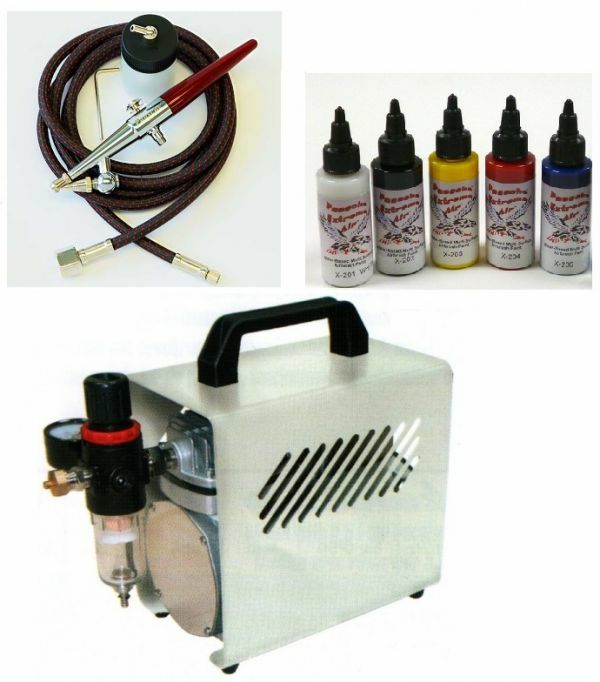 Excellent "PAASCHE" airbrush kit composed of high quality brand products. The airbrush features a chrome plated body for durability. The H single action allows the user to achieve fine lines down to 1/16 inch and wider patterns of up to 1-1/2 inches. The H is simple and easy to use and requires very little practice compared to single action models. The best uses are those requiring more basic spraying like solid coats, uniform lines or stencil work. Clean up is as simple as spraying your paint cleaner though the airbrush. The H is used for many applications including hobby, craft, chip and ding repair, taxidermy, ceramics, cake decorating, tanning, tattoos, etc. - wrench and 6' hose. Portable silent compressor with pressure regulator, anti-condensation filter and automatic ON / OFF. The Extreme Colors for Airbrush, thanks to the specific formulation, offer a fluid and continuous delivery, without nozzle blockage. They can be used on any surface: fabric, plastic, metal .. The range consists of 15 opaque colors, 7 pearly colors and 5 fluorescent colors, supplied in a 60 ml bottle with fine dispenser. They are suitable for all spray guns with a 0.5 mm nozzle. If diluted with Extreme Air Reducer, they can also be dispensed with finer nozzles. Read the reviews of our customers on Airbrush Kit "PAASCHE" of the category Starter Set. With us you will find only satisfied customers, thanks to a technical assistance made by those who really know the world Starter Set. Review Airbrush Kit "PAASCHE" of the brand Aerografando. Trust in the quality and professionalism of Aerografando on the sale of Airbrush Kit "PAASCHE", only from us you will find the best prices. Mini stencil aerografo ARTOOL "Tiki Master II-Hula Spirit"
You want to have more details on Airbrush Kit "PAASCHE" KITPAASCHE or more generally on ours Starter Set? You are looking for a Starter Set but do not you find it in the catalog? Staff of Aerografando will answer all your requests. Notify me of updates to Airbrush Kit "PAASCHE"
KIT Iwata Airbrush "Exercise Kit"